Russia has never faced so many challenges at once like now, including the crash of oil prices and severe Western economic sanctions. However, it adapted to a new economic reality and even managed to stabilize, Russian Prime Minister Dmitry Medvedev said. “For the first time in Russian history since the breakup of the USSR, we have come under the influence of two external shocks immediately: the sharp decline in oil prices and serious unjustified sanctions. Our country has never run into such a collection of challenges at the same time,” Medvedev said on Tuesday in an annual report to the State Duma, the lower house of the Russian parliament. The reality in 2014 appeared to become more complicated than the worst expectations, according to the Prime Minister. He compared the oil prices fall to $9 per barrel in 1998 to the present time, “considering the dollar’s changing purchasing power and a number of other economic factors and indicators”. The latest sanctions are also the worst in the history of the country, he said. The losses the Russian economy has sustained from sanctions are significant; according to the Prime Minister some experts have put it at €25 billion. Negative trends in Russian economy will continue throughout 2015, he added. “In January-March the GDP dropped by 2 percent, the volume of industrial production by 0.4 percent. 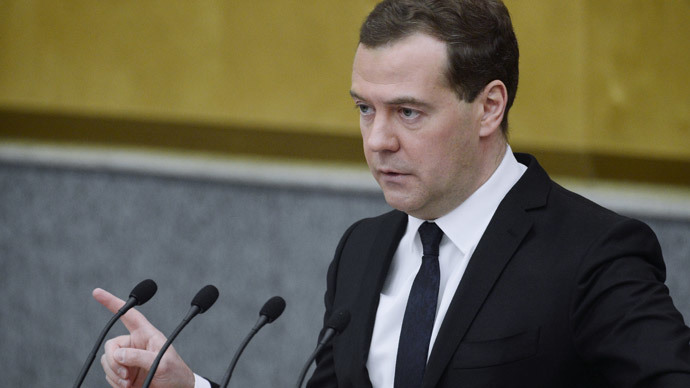 The greatest decline felt has been noted in investment activity,” Medvedev said. If the external pressure increases and oil prices remain at extremely low levels for a long time, we will have to develop in a different economic reality, which will challenge our strength, the Prime Minister said, adding that he was confident that Russia could live even in such a reality. However, the Russian PM says the current crisis is not the worst possible, especially since the situation managed to stabilize. “Everything that is happening is far from a worst-case scenario and could be much worse and much more difficult,” Medvedev said pointing to unemployment, the situation with prices, the state of the banking system and the production sector. He claimed that last year the Russian government started to take steps, given the past experience of the 2008 crisis. The foreign exchange market calmed down and the economy is gradually adapting to the floating exchange rate of the ruble. "We still maintain a relatively low level of public debt. The federal budget deficit, although slightly increased, according to the results of this year will remain at an economically safe level. Unemployment remains within reasonable parameters, it is low against corresponding conditions in other countries," Medvedev said.